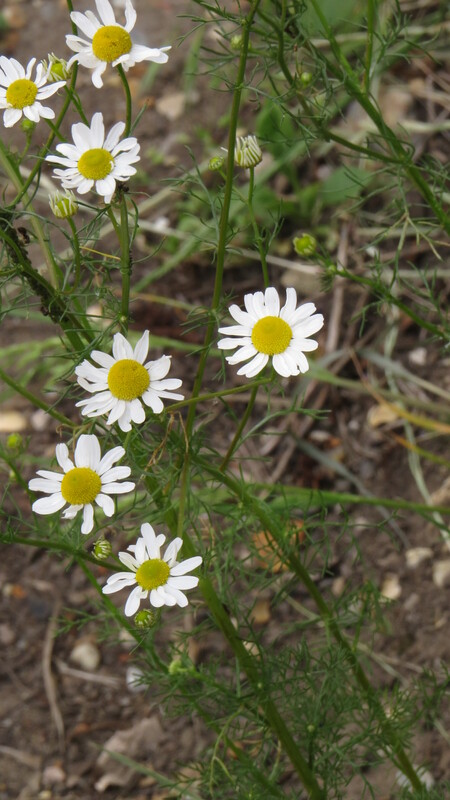 Dear Readers, there are a large number of white daisy-like plants in flower at the moment, but the combination of a faint pineapple-scent and a ‘squashy’ receptacle (the round yellow bit) tells me that this is Scented Mayweed. It is one of a large family of plants which have the word ‘chamomile’ included in either their common or Latin names – ‘Chamomile’ comes from the Greek for ‘Earth-Apple’, which seems to be a reference to its fruity scent. 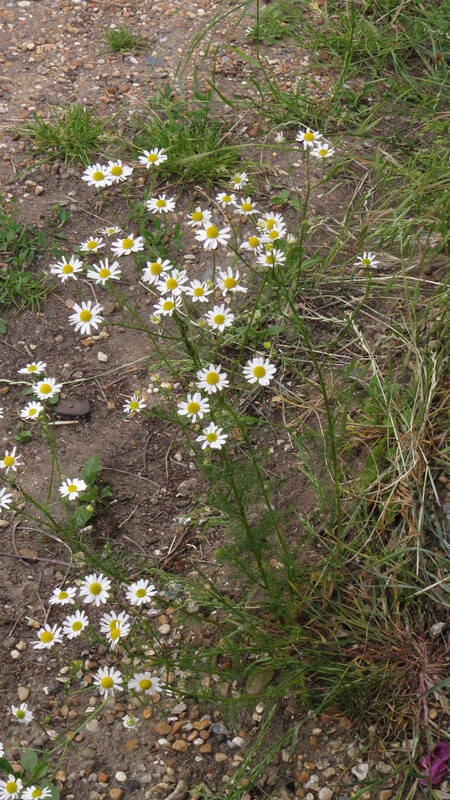 Scented Mayweed is also known as German Chamomile, and is an annual plant of bright, open places, often with disturbed soil. ‘True’ or Roman Chamomile (Chamaemelum nobile) has a stronger scent, and is a rare perennial plant of damp turf and sandy, mildly acid soils. There has been a lot of confusion about these plants, but both have been used for their extensive medicinal and cosmetic applications. 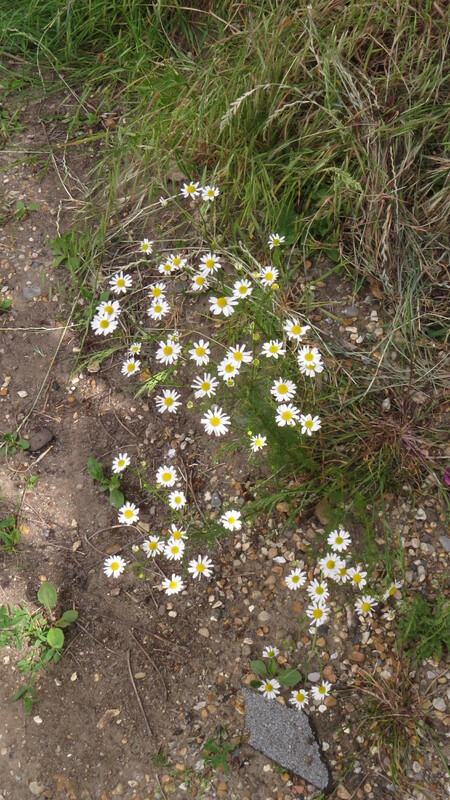 I was pleased to see Scented Mayweed in the Unadopted Road in East Finchley last week for another reason – its open flowers are very popular with pollinators such as hoverflies. Scented Mayweed is described as an ‘Ancient Introduction’, which means that it arrived before 1500 (in this case from the warmer parts of mainland Europe and northern Asia). It has a venerable history: garlands of this flower were found in the tomb of Tutankhamun, and it is included in the herbal traditions of no less than 26 countries. It has been used for many things: as a tea for relaxation, as an insecticide, as an anti-inflammatory and for digestive disorders. No wonder it arrived in the UK – it sounds as if it would have been an indispensable part of any healer’s medicine kit. It does contain a small amount of a poisonous chemical called coumarin, which could cause nausea and vomiting, and on the Plant Lives website it warns that this is what will happen if the flowers are boiled for ‘more than seven minutes’. It can also be an allergen for those susceptible to hay fever, which is one reason why my husband doesn’t drink chamomile tea – he finds it sets him to sneezing. 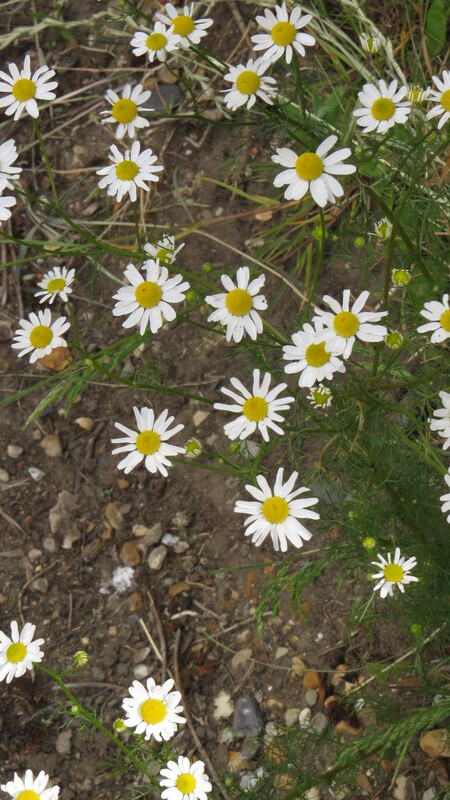 Scented Mayweed produces a yellow dye, which is used in many cosmetic products for blonde hair. It is also a perfumery ingredient: the oil which contains the distinctive pineappley smell is dark blue, and is called Azulene. I am indebted to the Fragrantica website for this information, which also contains the interesting fact that Chamomile is a keynote in Dior’s Fahrenheit for Men. In the book by Beatrix Potter,Peter Rabbit’s mother gave him a cup of chamomile tea to help him after his ordeal on Farmer MacGregor’s farm, and what a wise thing this was. When I’m feeling anxious, I find that chamomile tea helps me too. What I had never done was make the link with Scented Mayweed. Plants have such a lot to teach us, if we have ears to hear, and curiosity, and that most wonderful resource, the Internet. This entry was posted in London Plants on June 17, 2015 by Bug Woman. Thanks for this interesting post…I often see it whilst out walking and recall the pineapple smell from my childhood days…very reminiscent of those lovely but very sickly pineapple cream cakes!